A wide range of TNP users include surveyors, engineers, fire and rescue personnel, real estate agents, hunters, hikers, and geocachers. Anyone who uses maps and GPS will find uses for Terrain Navigator Pro. For this review, I was provided a copy of TNP version 8.70 and data files for the state of Georgia (Figure 1). First I installed the viewer and left the map and image data on the DVDs to save hard drive space. Then I re-installed the viewer, this time loading all map and image data as well. This allowed the program to run faster when selecting, zooming, and panning between image panels. You can view each map panel separately or seamlessly. TNP is sold with map and image data for one state and includes a one-year subscription to download additional photos within that state. You can purchase additional states and additional yearly subscriptions. Some of you may be thinking, “Why should I purchase a software package like this when I have access to free internet resources like Google Earth?” I was thinking the same thing until I created a project and started browsing through the map and image options. One of the options available is to use Google images inside the TNP viewer, putting the mapping, annotating, layering, and GPS tools right where you need them. When you launch the software, the Open Map window opens (Figure 2). Several different quads are available as well as aerial photos and Google Earth. You can see coverage areas for each. You can change between them at any time with the scale drop-down menu located near the middle of the tool bar. Locating my project area was easy in TNP. I can search for maps by street address, zip code, latitude and longitude, feature name, or by clicking on the index map. TNP has a nice help file that walked me through the basic functions, and in less than an hour I was comfortably finding places and exploring the image and map options. 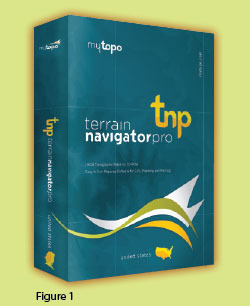 My first impression of Terrain Navigator Pro is that this is a great tool for pricing projects. Some counties have very useful property tax records available online and some also have county-wide GIS databases available with aerial imagery and several search options. Other counties, unfortunately, do not. I work in several counties that fall into that second category. With TNP, the tools I need to prepare proposals quickly and accurately are all found in one place. I can get a good idea of obstacles and conditions and arrive at a good estimate of time required to complete the project. I often add a picture of the project site to my proposal. TNP makes this simple and professional looking. Everyone loves pictures, and many times the person requesting the survey knows nothing about surveyors or the work we do. The use of project exhibits in my proposals helps me communicate the amount of effort involved in completing a project. It’s also a great way to make sure that I have been given a correct description of the project site. The last thing I want to do is provide a survey of the wrong property. As I’m researching and pricing a project, I can also develop a good plan for my fieldwork. I take note of streams, roads, wood lines, and adjacent improvements. I can key reference plats and deed descriptions into an AutoCAD drawing, export them to .dxf files, and then overlay them to get a good idea of where to look for corners. Sometimes fences, hedge rows, and other physical features give clues as to where a property corner is likely to exist. Other times, especially with large tracts of undeveloped land, very little visible evidence is there. With TNP I can export waypoints to my GPS receiver to help me get near the property corner locations quickly (Figure 3). I used the GPS set-up wizard to connect my Magellan Meridian handheld (Figure 4). TNP provides a layer that displays USGS survey control markers (Figure 5). I can quickly see existing survey control near my project. Clicking the control point symbols opens the data sheet in a separate window. I can review the datasheets and identify control that is likely to still exist. When I leave the office, I have a good plan, and hopefully very few surprises are waiting for me. While TNP serves as a great research tool, I have only scratched the surface of what it has to offer. Using GeoPins, you can place file shortcuts on maps for a quick and easy project cataloging system. Shape files, dxf files, and kml/kmz files can be imported to create project exhibits and survey reports. Maps, images, and map data can be exported for use in Auto-CAD and other drafting software to use in creating deliverables, exhibits, and design base maps. Since the best way to get from one point to another is not always a straight line, TNP’s 3D function allows you to rotate and tilt the map panels to see the terrain relief from any angle (Figure 6). You can also exaggerate the relief for viewing relatively flat areas. Most of the places I work are low, flat coastal areas, but North Georgia is entirely different terrain. 3D glasses are included to view map relief in greater detail. Now for some play time. My family and I enjoy geocaching together. My kids call it “treasure hunting.” We used TNP to plan our day’s activities. We created waypoints for each location and printed maps of the surrounding areas. As with many things, the more I use TNP, the more ways I find to use it. Terrain Navigator Pro is a handy tool for any surveyor. The mapping features of the software combined with MyTopo’s online resources make it an affordable research tool that goes well beyond project planning. I encourage you to take a closer look at Terrain Navigator Pro. Visit their website, www.MyTopo.com, where you can read software package comparisons and comments from other users. See for yourself if this might be a useful addition to your surveying toolbox. J. Craig Brewer, PLS is owner of Brewer Land Surveying in Savannah, Georgia. He has over 15 years of experience and is a licensed professional surveyor in Georgia and South Carolina.